DVB-T (which stands for Digital Video Broadcasting — Terrestrial) is the DVB European-based consortium standard for the broadcast transmission of digital terrestrial television. DVB-T has been further developed into newer standards such as DVB-H (Handheld), now in operation, and DVB-T2, which was recently finalised. DVB-T transmits compressed digital audio, video and other data in an MPEG transport stream, using COFDM modulation. The transmission mechanism, which is based on data symbols, uses Multiple Carrier Frequencies. OFDM works by splitting the digital data stream into a large number of slower digital streams, each of which digitally modulate a set of closely spaced adjacent carrier frequencies. In the case of DVB-T, there are two choices for the number of carriers known as 2K-mode or 8K-mode. Within each frequency, DVB-T offers three different modulation schemes (QPSK, 16QAM and 64QAM) which choice is made depending on a robustness versus data rate compromise. The Guard Interval is the duration that allows to separate symbols in time in order to allow the receiver to handle a given amount of delay in the transmission path. One of the main advantages of OFDM is that it allows the receiver to cope with strong multipath situations. DVB-T also allows single frequency networks (SFN) operation within a given geographical area, where two or more transmitters carrying the same data operate on the same frequency. In such cases the signals from each transmitter in the SFN needs to be accurately time-aligned, which is done by sync information in the stream and timing at each transmitter using the GPS timing reference. The Guard Interval length can be chosen according to a trade-off between data rate and SFN capability : the longer the guard interval, the larger the potential SFN area. 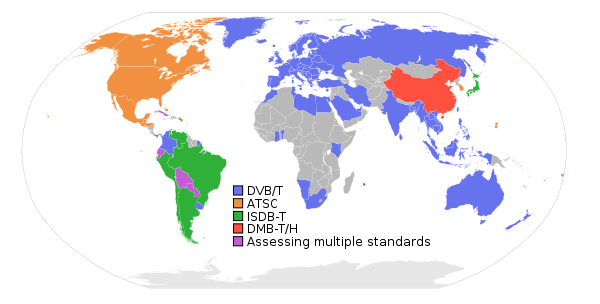 Defined initially as a European norm, DVB-T has been adopted or proposed for digital television broadcasting by many countries throughout the world.